Word-Of-Mouth is immensely powerful. In fact, it’s the BEST marketing tool you have. We believe that every marketer should know that, so we created an infographic to explain why backed with facts, statistics and… zombies? Enjoy! The apocalypse of marketing as we know it has arrived. Consumers are avoiding traditional advertising like the plag… zombies. Though consumers are boarding their windows to keep old school ads away, there’s one thing they increasingly trust. Trusted by 86% of consumers, Word-Of-Mouth is the MOST trusted form of marketing. Comparatively, only 62%, 60% and 48% of consumers trust TV ads, print ads and social media ads respectively. Before making a purchase, consumers tend to listen out for what others have to say. That’s why 90% of consumers search for reviews before purchasing a product. Which is AWESOME, because:##59% of consumers enjoy telling others about new products and they do so over 3.3 billion brand mentions in 2.4 billion brand related conversations everyday in America. Those conversations are probably driving the economy – surveys show Word-Of-Mouth influences every other purchase decisions. Word-Of-Mouth also gives you #AWESOME customers – Customers acquired through Word-Of-Mouth spend 200% more than the average customer and make 2x as many referrals themselves. 49% of U.S. consumers say friends and family are their top sources of brand awareness. These referrals are super effective. A consumer is up to 50x more likely to buy a product if it’s recommended by close friends or family. 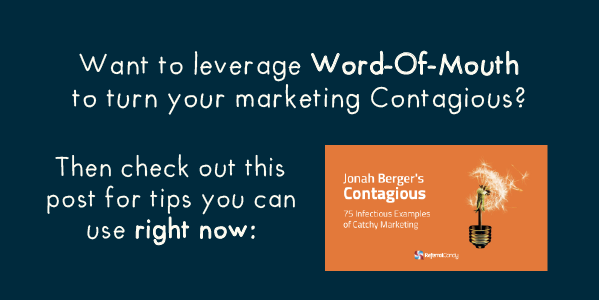 The greatest thing about Word-Of-Mouth is that it keeps spreading. It takes just 1000 customers to generate HALF A MILLION conversations about a brand! Humans are social creatures, we’re wired for social influence and Word-Of-Mouth. That means nobody is safe from Word-Of-Mouth… not even you!